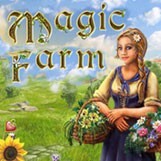 Download Magic Farm free here. The game contains a touching and entertaining story about a young florist and her cute little dragon helps. The young girl wants to rescue her beloved parents who drowned in the jungle. She has to supply funds to different people, so she puts her florist skills on a test. You must help the girl to care and sell different flowers and fruits. Both gardening and business activities are essential for achieving your goal. Find Magic Farm, mark it and choose "Uninstall"
Should Magic Farm has been damaged or corrupted and thereby difficult to remove we can recommend you finding help to uninstall it here.